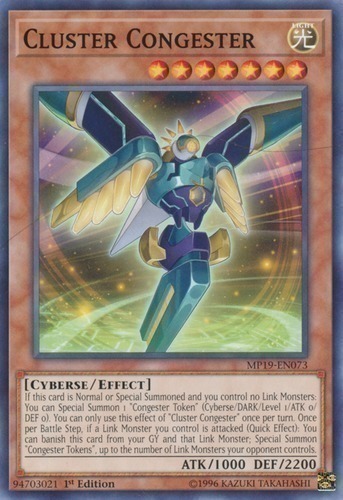 If this card is Normal or Special Summoned and you control no Link Monsters: You can Special Summon 1 "Congester Token" (Cyberse/DARK/Level 1/ATK 0/DEF 0). You can only use this effect of "Cluster Congester" once per turn. Once per Battle Step, if a Link Monster you control is attacked (Quick Effect): You can banish this card from your GY and that Link Monster; Special Summon "Congester Tokens", up to the number of Link Monsters your opponent controls.